TAHGC CATALOG VERBAGE: Pacific theater aerial/naval action of WWII. YEAR PUBLISHED (EDITIONS): First Edition 1978; second edition 1981. Two rulebook editions were in print by TAHGC. A 3rd edition is available from the VIP community shortly. UNIT SCALE: Capital Ships, Land Based Air, submarines, Marines/SNLF. NUMBER OF GAME TURNS: Eight; optional turn 9 variant. GAME INVENTORY: ### unit counters; approximately 14" x 22" mounted mapboard; rulebook, 1 die; 8 page rulebook. 11"x14"x1.5" flat game box. WBC & AVALONCON HISTORY: VIP has been a tournament title since the first Avaloncon , remains a continuous event at World Boardgame Championships. VIP remains one of the strongest events in FTF and PBEM tournament play.. The WBC gamemaster changes as years progress. . An additional VIP dedicated tournament is held by Glenn Petroski, MIDWEST OPEN, the first weekend in March in Kenosha Wisconsin. It is debatable which is the most prestigious championship. VIP is also a tournament at Prezcon [aka The Winter Nationals], typically held in the 3rd week of February at Charlottesville VA.
A polished VIP application VASSAL module exists and is posted on the VASSAL site. John Pack's VASSAL INSTALL & PLAY TIPS was created as VASSAL is now the default interface for VIP activity managed by John's www.gameaholics.com site. I have played 10+ games using a simple color formatted Microsoft world file (.doc). This formula laden excel spreadsheet calculated the turn summary and running total of POC. Earlier generation softcopy tools such as WARGAME PROCESSOR,s or CYBERBOARD, AIDE DE CAMP; are alternatives to VASSAL however these are not necessarily free, platform independent, support real time server play or step review of PBEM turn (all features of VASSAL)..
PBEM OPPORTUNITES: A Boardgamer Players Association (BPA) single elimination tournament is held annually. Contact BPA if interested [or refer to John Pack's site linked below].. A continuous King of the Hill WAS PBEM ladder occurs on the four month cycle. John Pack is the current moderator of the VIP AREA PBEM Ladder. PBEM ladder guidelines and rule clarifications are found on John's VIP site. 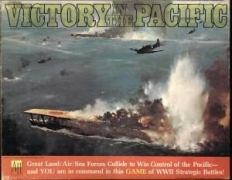 WARGAME ACADEMY COMMENTS: VICTORY IN THE PACIFIC is one of my favorite titles as combines both simplicity and ample variations of strategy. Like WAR AT SEA its predecessor a lot of die are thrown and one must react to the outcome to the results of the previous rounds of battle. Different from WAS, two round movement, numerous land based air, marines and islands/ports are additional keys to victory. Disguised by the volume of die rolls, many variations of strategy and flexibility are required to marshall the various resources to obtain a victory. Every time my confidence in my game ability in this titles rides high, I am consistently squashed by one of the Masters of this title. The regularity of the same names at the top of the VIP AREA ratings is a testament that this is game of skill & mind and not random luck. WARGAME ACADEMY GAME TOOLS: Softcopy rulebook, word/text PBEM sheet, trustee of the Vassal module (Java: free, platform independent, supporting step review PBEM and server play), extensive article archive converted to PDF. James Eliason and John Pack's NT1 variant is found at http://www.gameaholics.com/vitp_articles/turn_one.htm. ACCOLADES: 1977 Charles Roberts Award Best Strategic winner.